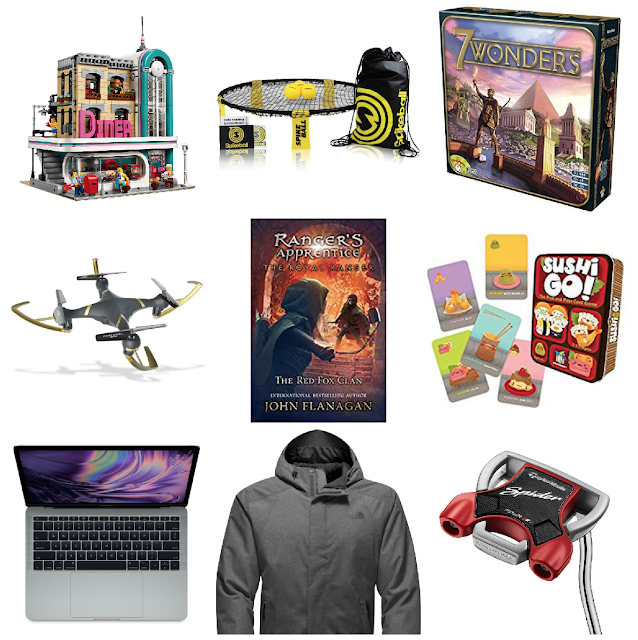 It's time for this year's list of "Christmas Gift Ideas" and another "Sleighful of Giveaways" from my amazing and generous sponsors! Despite our big move last month, I somehow managed to pull it together at the last minute with some help from my children!! Now I need to get back to unpacking and find the rest of our Advent boxes... We are all looking forward to Advent and Christmas in our new home and parish! 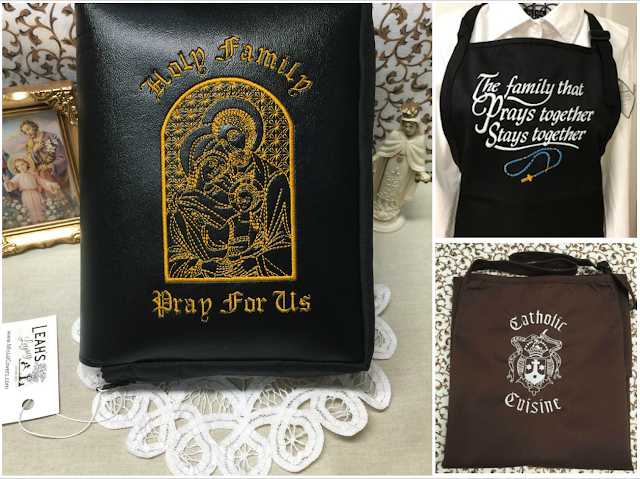 You can find the lists from the last three years here, here and here, as well as even more Catholic gift ideas listed in my past Easter posts as well: 100+ Easter Basket Stuffers & Catholic Gift Ideas and Easter Symbols: Catholic Gift Ideas. 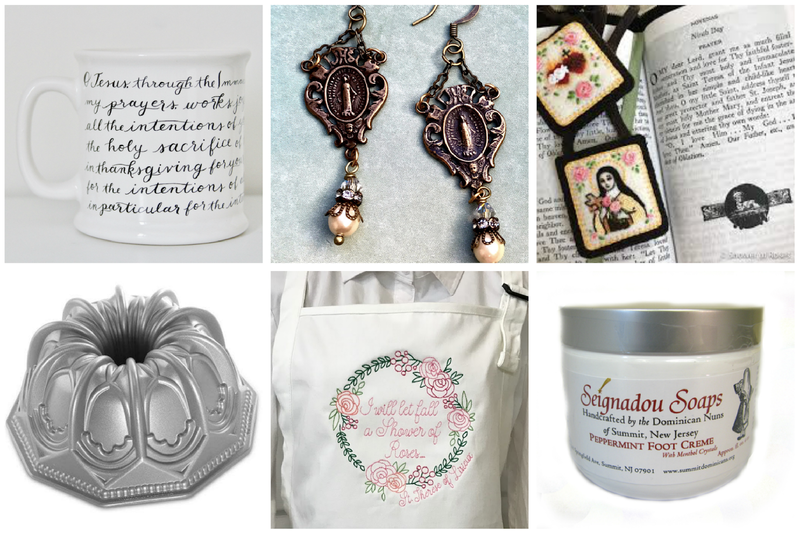 Some of the items below have been featured in the past but they are still favorites. 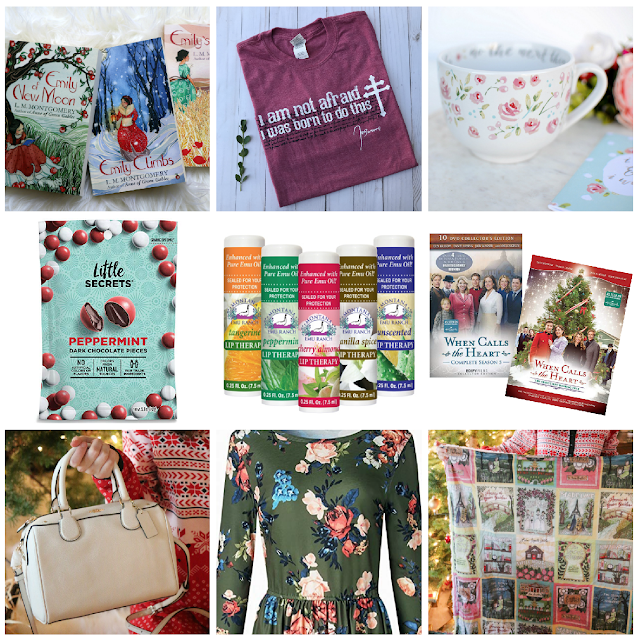 Be sure to scroll all the way to the bottom to enter the giveaway for a chance to win one of 25 PRIZES, from my generous sponsors here at Shower of Roses, with a combined value of over $1,800! 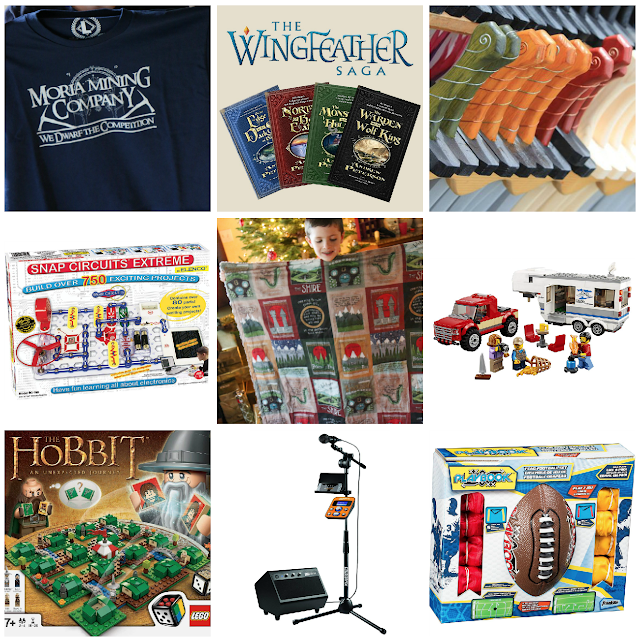 Please keep these Catholic businesses in mind when shopping for gifts this Christmas season! Note: All links to Amazon are affiliate links. If you choose to click any of the links, then add an item (any item!) to your cart and complete the purchase, I will receive a percentage. Thank you!
. : Fun New Finds for Advent and Christmas 2018 :. Drinking with St. Nick: Christmas Cocktails for Sinners and Saints from the author of Drinking with the Saints: The Sinner's Guide to a Holy Happy Hour - I don't drink but I enjoy reading these books! The Holy Family Nativity Play Set from Shining Light Dolls - Love the expecting Blessed Mother! 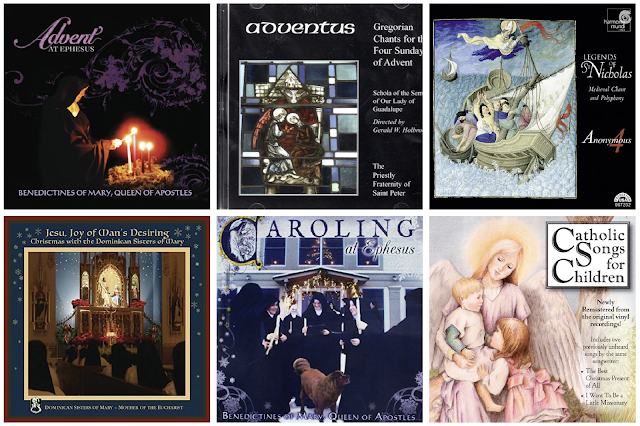 Perfect for Advent! Our Lady of Guadalupe: The Graphic Novel - Also available directly from TAN. LEGO Advent Wreath - My boys have all the LEGO they would need to make this on their own, but fun idea! Around the Year with the Von Trapp Family - I have a treasured vintage out of print copy of this book and am so happy to see it back in print! I pre-ordered a copy of it to give my oldest daughter back in September... but I forgot to change the shipping address and it's sitting on my porch back in Oregon. My Jesse Tree Sticker Set - This looks fun! 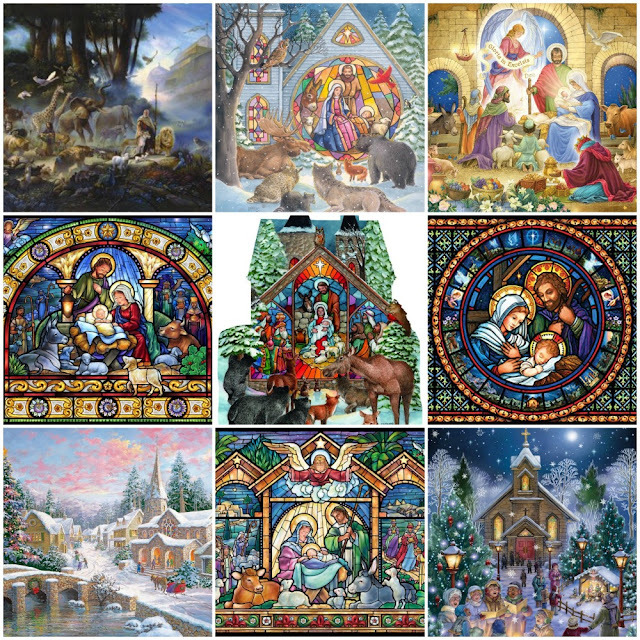 Celebrating a Merry Catholic Christmas: A Guide to the Customs and Feast Days of Advent and Christmas - Haven't seen this in person yet but it looks great! Nativity Tea Light Candle Lantern - I bought this last Christmas but I don't think I ever shared it here on the blog. The Bible Story from St. Augustine Academy Press (Also available on Amazon here) - This would make an excellent addition to the Jesse Tree.
.: Some Favorite Advent and Christmas Music :.
.: Favorites for the Feast of St. Nicholas :. 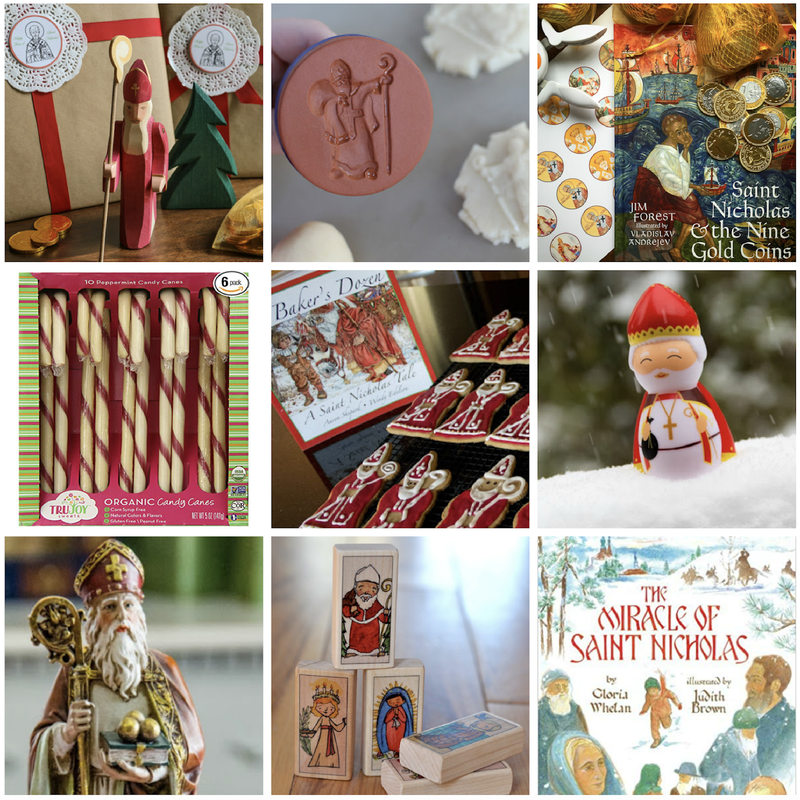 St. Nicholas with Moveable Arms from Ostheimer - Plus Free Printable St. Nicholas gift Tags in the archives! You can find him from Bella Luna and The Wooden Wagon. This is another version. 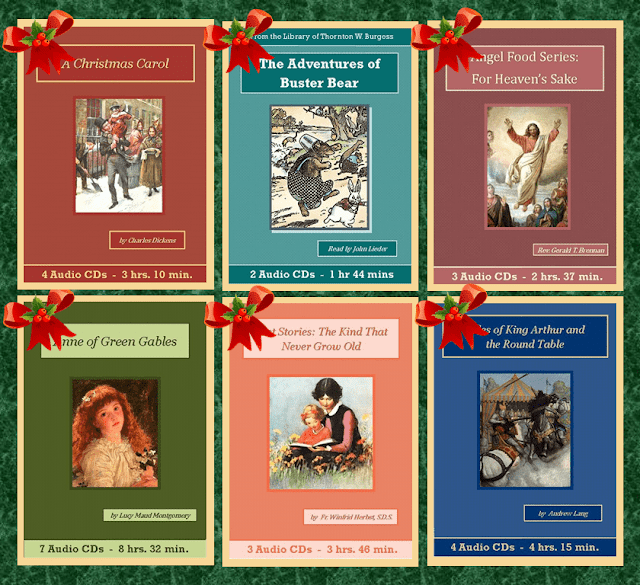 St. Nicholas and the Nine Gold Coins - Review can be found here. 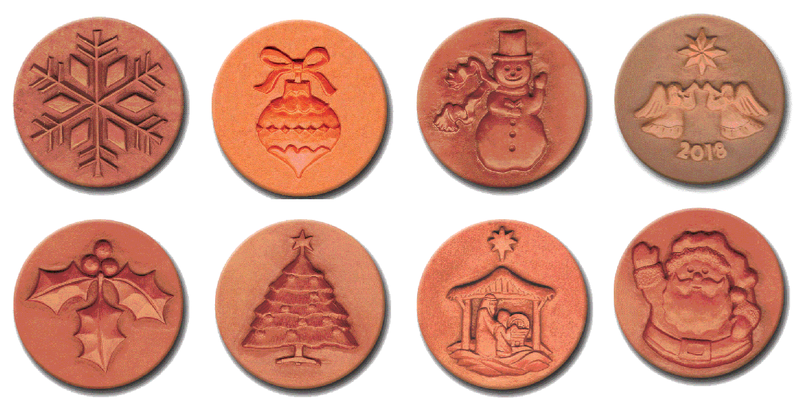 Plus decorate your own St. Nicholas Chocolate Coins with this free printable. TruSweets Organic Candy Canes - One of our children is allergic to Red 40. Love that theses are made without food coloring! I bought a couple boxes from Thrive last year. If you don't have a Thrive membership, here's my referral link to save you 20%. You can also find them at Natural Grocers. St. Nicholas Shining Light Doll - picture from our snowy 2013 celebration! Scroll through all of our past St. Nicholas posts here.
.: Favorites for the Feast of Our Lady of Guadalupe :. Our Lady of Guadalupe and Our Lady of Guadalupe Pop-Up Book - More pictures can be found here. 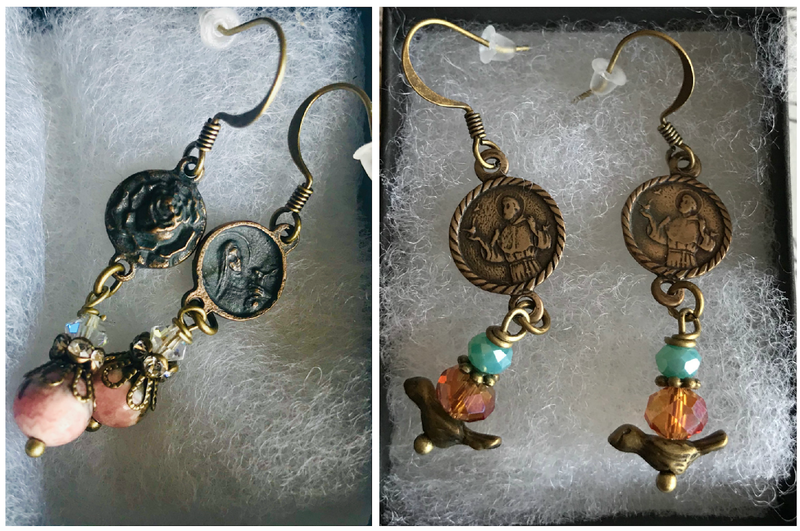 Our Lady of Guadalupe and Crown from The Little Habit - You can enter to win this below! and we usually celebrate with an Our Lady of Guadalupe Brunch or Dinner! 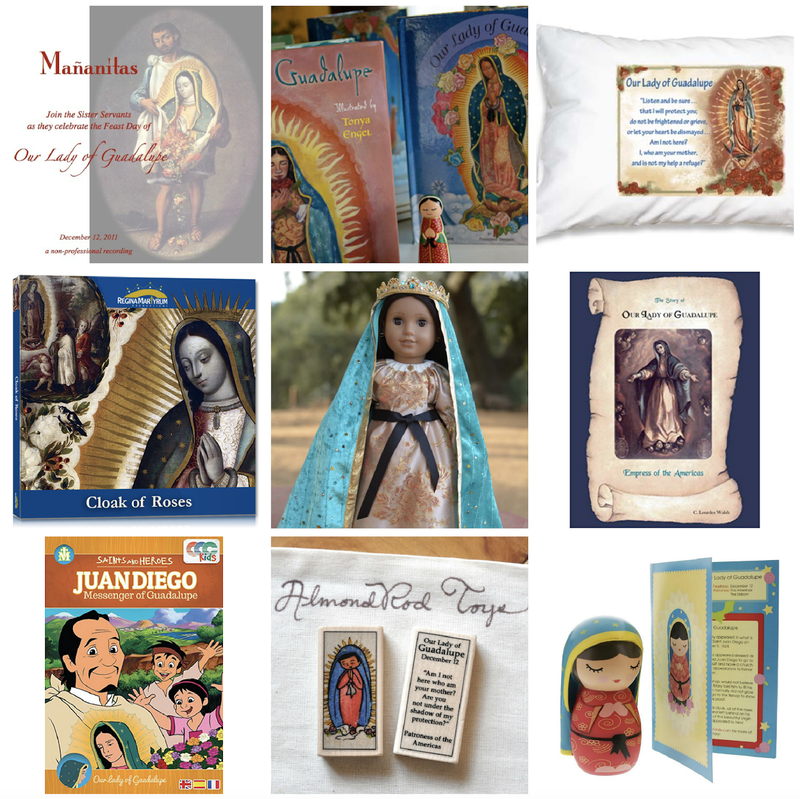 Scroll through all our past Our Lady of Guadalupe posts here.
.: Favorites for Santa Lucia Day :. Lucia Mug with Song - Such a cute mug! It's no longer available from where I purchased it, but I just found it online here. Scroll through all of our past St. Lucy posts here.
.: Favorite Advent and Christmas Puzzles :. Our family loves putting together puzzles during Advent and Christmas.
.: Favorite Nativity Sets :. These are some of the nativity sets our family has collected over the years. 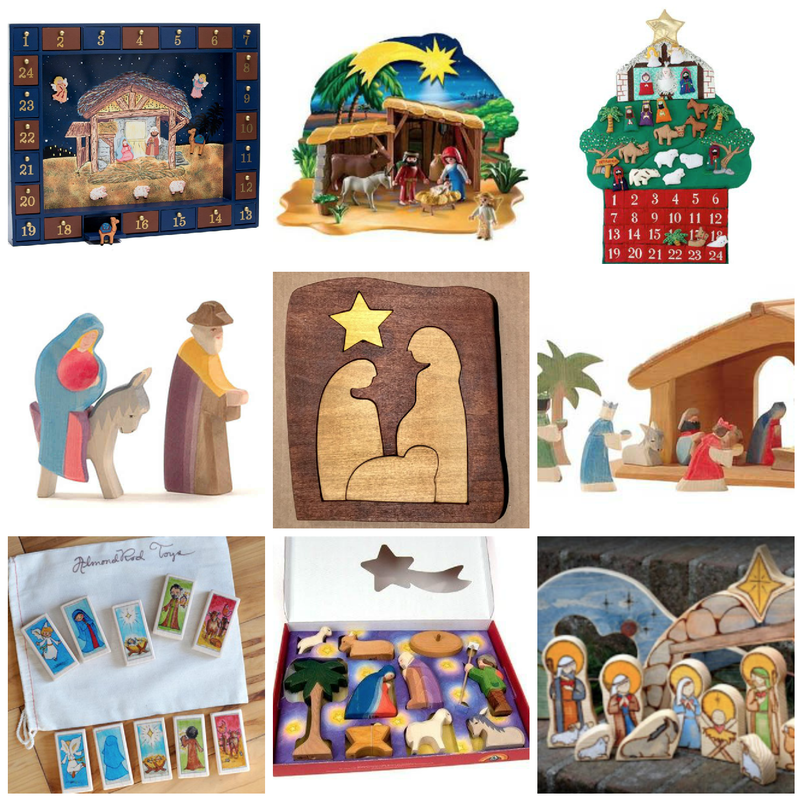 Ostheimer MINI Nativity - I purchased some of the pieces during a sale last year and plan to add a few more to our collection this year. 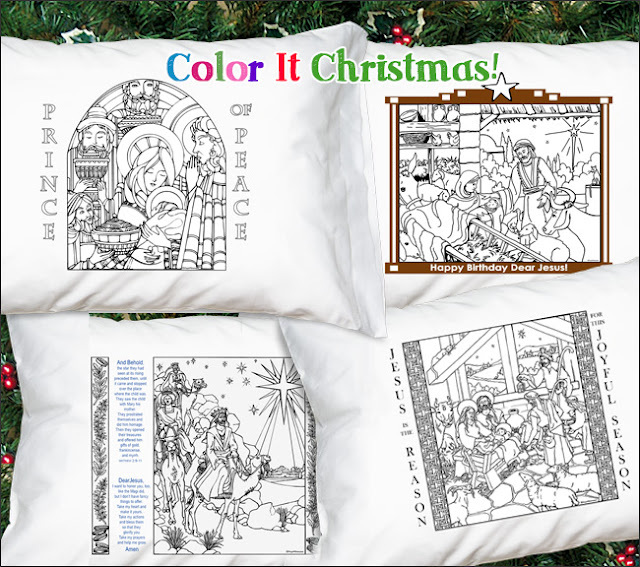 Ostheimer Nativity Set Full Size - This was a gift last year and I look forward to adding to the collection one or two pieces at a time. Available from Bella Luna. 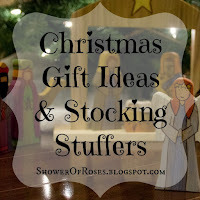 Brand new Nativity Set from Shining Light Dolls - I think this will become a favorite too! 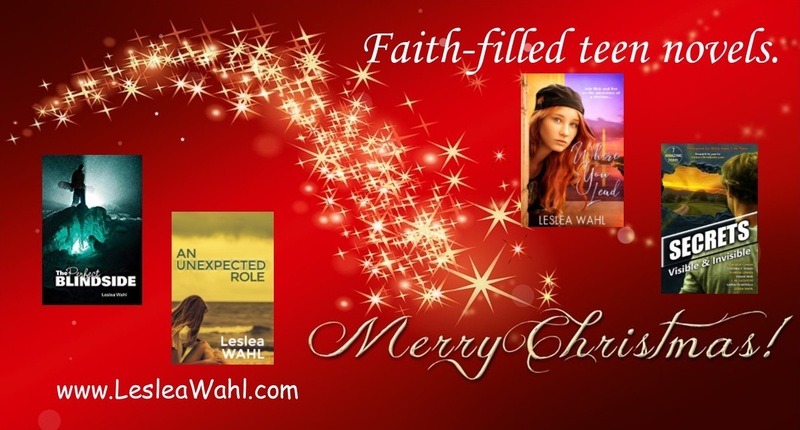 Please note: In addition to their stockings, our children usually unwrap three gifts from my husband and I on Christmas morning - something they need, something they want, and one other gift which is usually faith based. 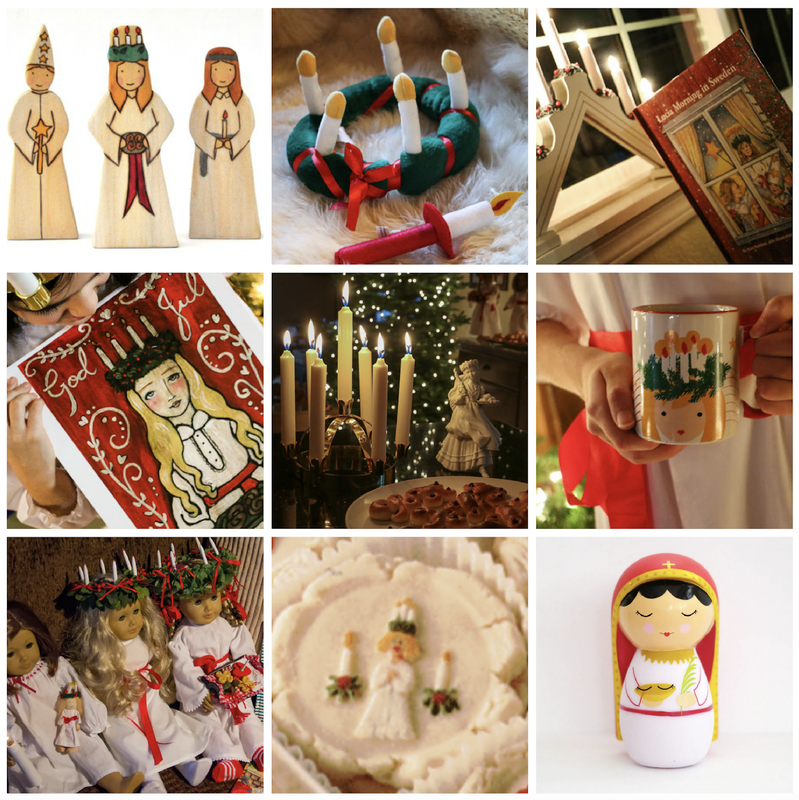 We draw names on the first Sunday of Advent for Christkindl and end with a family Christkindl gift exchange. It's always the first thing they want to do after our morning prayers (or morning Mass if we didn't make it to the Midnight Mass) on Christmas Day! They also receive a stack of books either on Christmas or Epiphany. The gifts listed below have been received over a number of different years/occasions.
.: Captain's Picks - Age 18 :. The Shadow of His Wings: The True Story of Fr. Gereon Goldmann, OFM - Still a favorite. 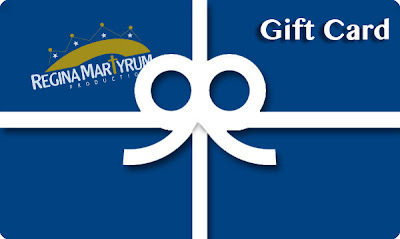 Gift Cards - Like food/snacks, gift cards are always a great gift for teens. Star Wars Catch Phrase - Played at friend's home. Very fun!
. : Ranger's Picks - Age 16 :. Wish List: LEGO Creator Expert Downtown Diner - The Detective's Office is definitely his favorite out of all the Modular sets, but this one is at the top of his wishlist. He also loves Architecture and Creator sets. Spikeball - We don't own this the boys had a blast playing it with their soccer team in Oregon! My mom let me know that she is planning on giving it to them this year! shhhh! 7 Wonders - A bit of a learning curve to play, but fun! Video Drone AP - This gift from Uncle Brian and Aunt Meagan last Christmas was a hit! North Face Men's Inlux Insulated Jacket - found this on clearance last year and it's now his favorite. Basically clothing is always a hit with my teens! Taylor Made Spider Putter - He saved up and bought this putter for himself last golf season.
.: Twinkle Toes' Picks - Age 15 :. St. Joan of Arc T-Shirt from Catholic T-Shirt Club - The boys enjoyed this subscription for awhile and then I changed it to a size S subscription for the girls to build up their collection of Catholic T-Shirts. Such a fun club! Montana Emu Ranch Lip Balm - Finally something that works! 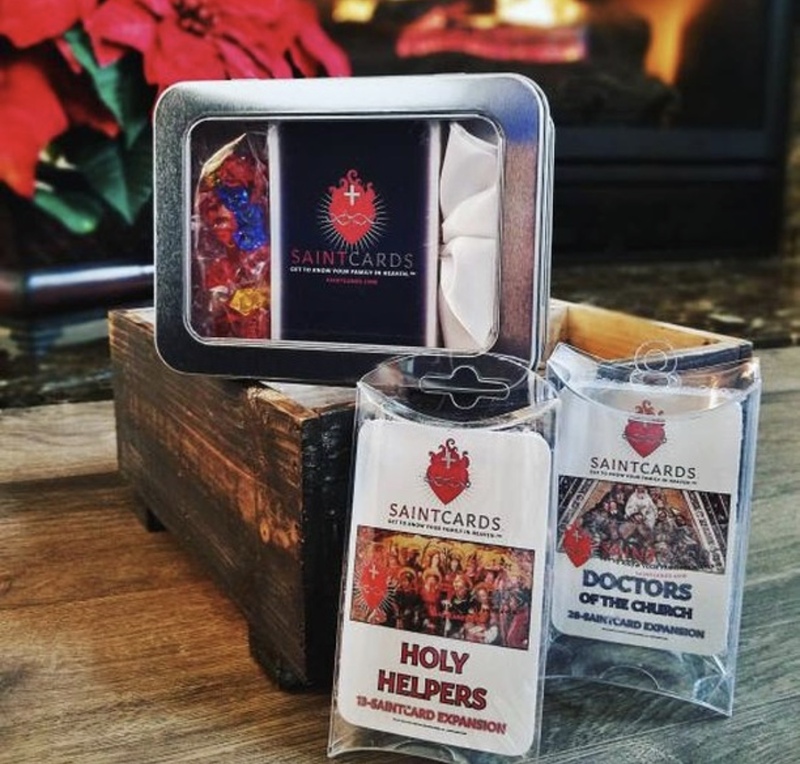 Wish List: When Calls the Heart Christmas Special and Complete Season 5 - She already has and loves When Calls the Heart Year 4 DVDs (She has the Collector's Editions of Season 1, Season 2, Season 3, and Season 4. Coach Satchel - Watch for sales on this... I paid less than $100. Custom Book Blanket from Sweet Sequels with all of her favorites!
. : Chiquita's Picks - Age 13 :. Hand-embroidered Scapular from StellaMarigoldArt - She and her sister received these years ago and after wearing them daily (including camping/swimming in them during the summer) they are starting to wear out.
.: Snuggles' Picks - Age 11 :.
.: Rose's Picks - Age 8 :. Calico Critters - These have been favorites for many years and are always on the list of favorites for all the girls. She loves her Kangaroo family!
. : Bud's Picks - Age 6 :. 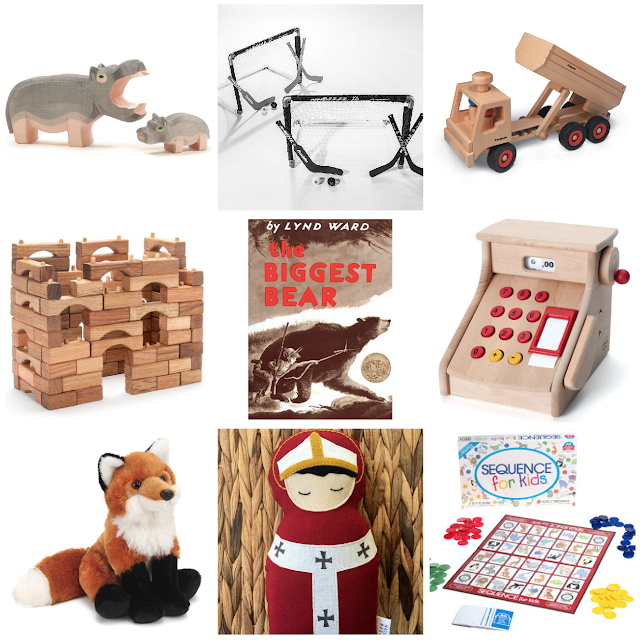 In addition to our collection of Lincoln Logs, Playmobil, Thomas Wooden Railway, and LEGO, here are some more favorite toys that Bud loves and I would buy again... He still LOVES his Red Fox too! "I want a Hippopotamus for Christmas..." - Last Christmas he got a Hippopotamus and this year the Baby Hippo is at the top of his wish list. Ostheimer Noah's Ark, Figures, and Animals have been past gifts and they are played with daily. I plan to add the Baby Hippo to his collection this year and maybe a few others. Like all handcrafted wooden toys, these are an investment, but they are so beautiful and definitely heirloom quality. 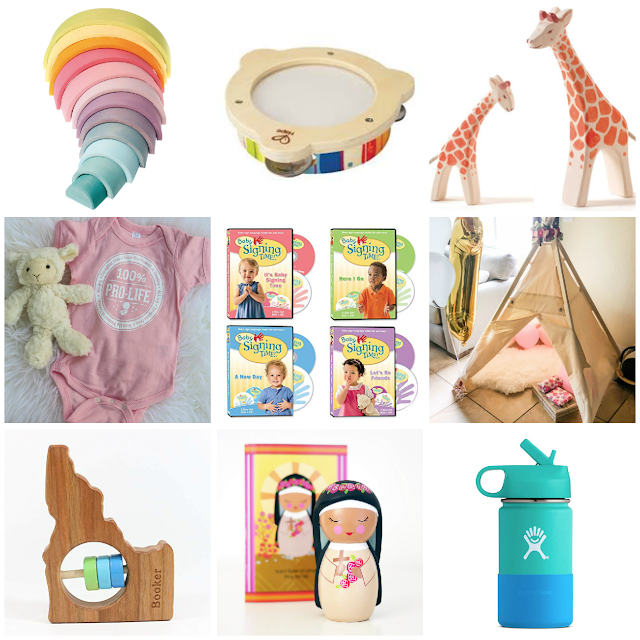 I always watch for sales from Bella Luna Toys and The Wooden Wagon. Interlocking Wooden Blocks from Nova Natural ... "Can I play with these now?! You can make all sorts of stuff with them!" The Biggest Bear ... "It's awesome." Cash Register from Nova Natural ... "It dings and it has real paper!" Red Fox - This one was on last year's list, but he still loves his Wild Republic Red Fox from his godparents. All of the Wild Republic stuffed animals are great. St. Thomas Becket Soft Linen Doll - I bought this last year and forgot to give it to him. It will be one of his gifts this year. 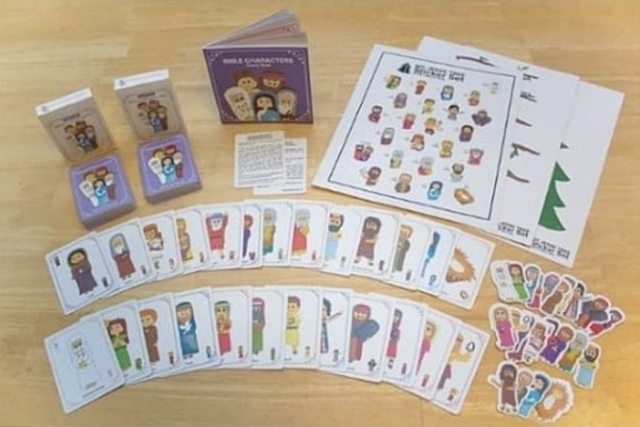 Sequence for Kids ... "Most of the games we play are boring.... but this one IS NOT!"
. : Grace's Picks - Age 1 :. Ostheimer Wooden Animals - She loves these too and will often be seen carrying around the Mama and Baby Giraffes. They are her favorite. All Natural Tnee's Tee from her Wild One Birthday - Available direct on their website. Idaho State Wooden Baby Rattle from Bannor Toys - I got her the Oregon Rattle last year (with Black and Orange Beads - Go Beavs!) and now we need to get her the Idaho Rattle too! She still loves her Rosary from Chews Life too!
. 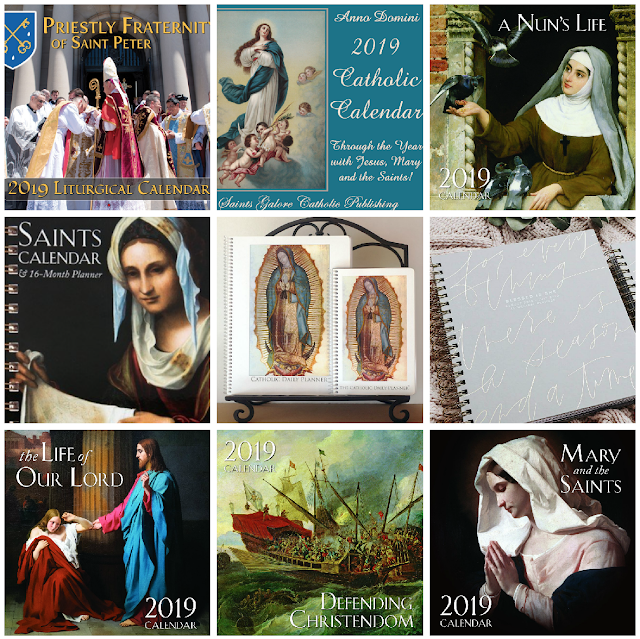 : A Few of My Favorite Things :.
.: 2019 Catholic Calendars and Planners :. 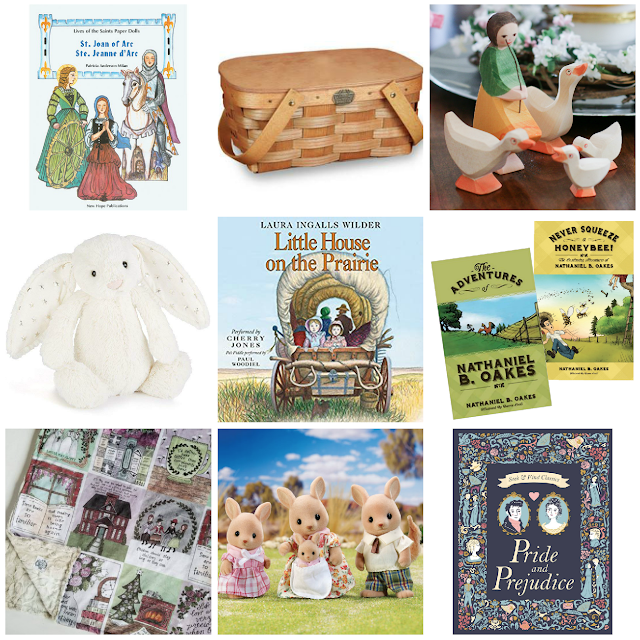 Here are the links to all of our book lists, our 2018 Advent Book Basket and the list of books our children will receive this year on the feast of St. Nicholas.
.: A Sleighful of Giveaways :. There will be one winner for each of the following 25 PRIZES from many of my generous sponsors here at Shower of Roses with a COMBINED VALUE OF OVER $1,800!!! "Wow! What a great giveaway!! Sure would be helpful to be a winner. " "I always love coming to your blog for ideas! Thank you! And I want an apron!! :) "
"Thank you so much for your hard work in compiling all of this! We would love prize #3,5,17." "Jessica, What lovely gifts! My favorites are the Grace & Grit set, st. therese rose earrings, almond rod blocks, sleightholm folk art, chews life rosary, cookie stamps, illuminated rosary book, and saintcards mega set. Thanks also for all the other great ideas selected by you and your children. Have a blessed advent!" 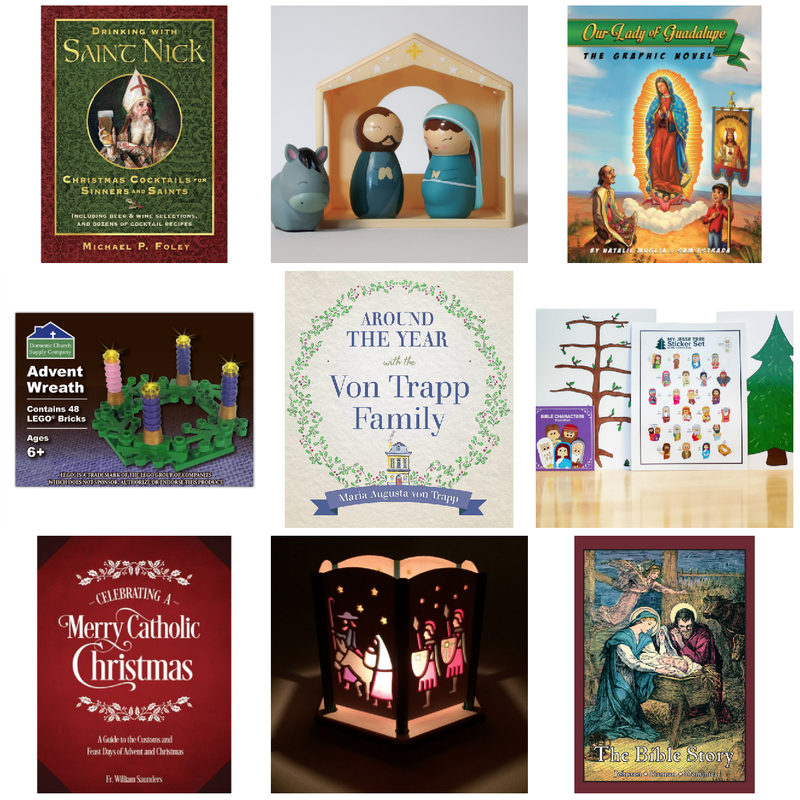 "Love all of the Catholic resources, especially the ones for children and young adults (saint cards, catholic books and nursery rhymes/audiobooks, chews rosary, missal cover, Jesse tree ornaments, Rosary hardcover book, and the OLO Guadalupe doll). Love your blog and Instagram page. 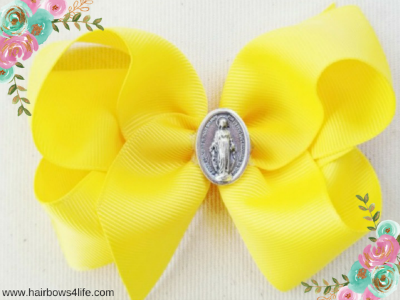 You are so resourceful and have so many great Catholic Tradition ideas to help sanctity each liturgy season and feast in the home. God bless you!" "I would absolutely love to win! Wonderful prizes!" "This is incredible!!! Everything is lovely! A favorite? 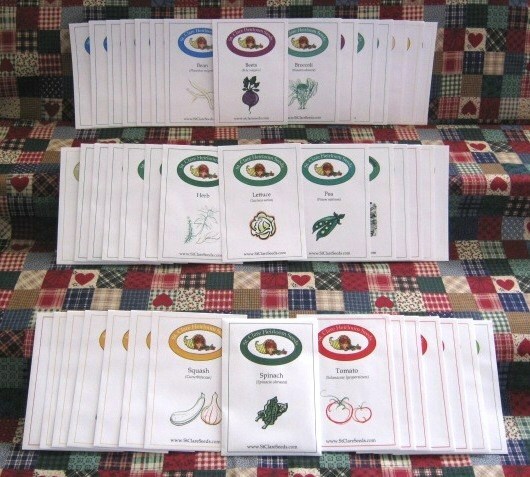 The missal cover, or Lilla Rose, or the Heirloom seeds or...seriously! Thank you for the opportunity! Have a happy Advent!" "I absolutely love your blog and return to this happy place on a weekly basis just to get inspiration and ideas! I have four small boys and we homeschool here. Thank you for all of your work - sharing your world with us. 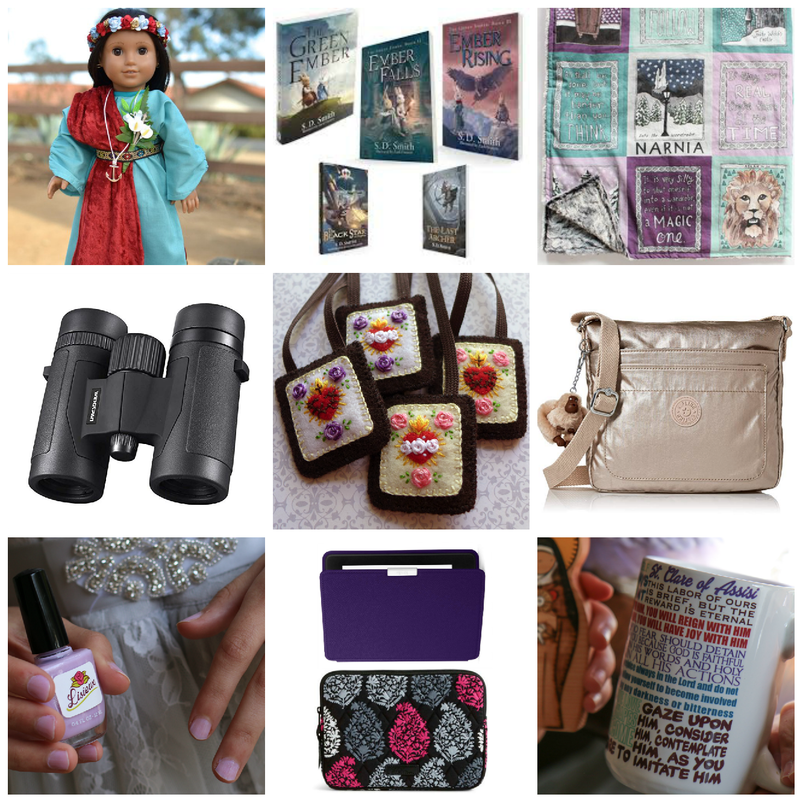 And thank you to all of your sponsors who help keep your blog going!" 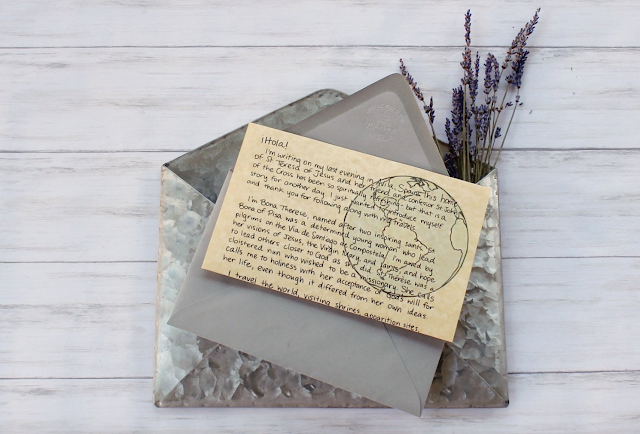 "Wonderful post! 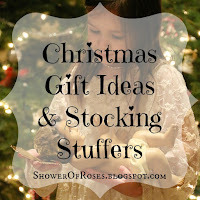 Such great gift ideas! My favorites are #2,8,9 & 11"
"I would be happy to win just about any of these but the books from St. Augustine Press and the almondrod wood block nativity prizes are a couple favorites." "I’d love to find out more about #11 and we’d love the saint cards/#13. Thanks for hosting this huge give-a-way!" "So many great things! My favorites would have to be the heirloom seeds, the prolife sweatshirts, and the cookie presses." "I would love to win one of these prizes: Prize #4, Prize #13, Prize #7, Prize #16, Prize #24, Prize #25, Prize #17, Prizes #8, Prize #9"
"So many favorites, difficult to choose any one or few. 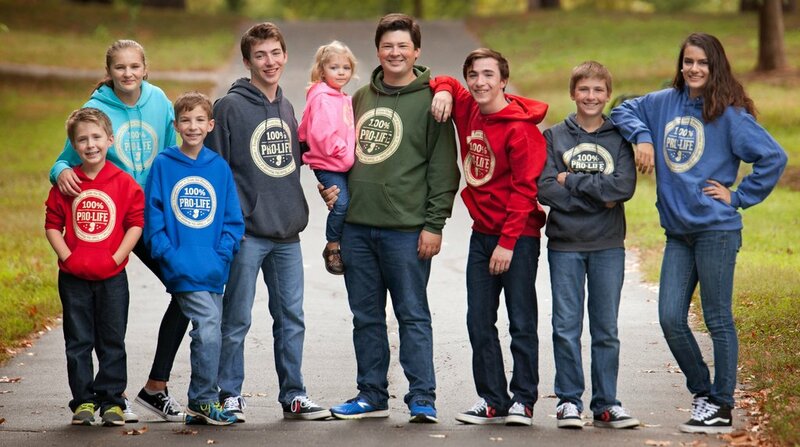 With my six children any of them would be so wonderful! Thank you for opportunity to enter this giveaway and for putting this together. I love reading your blog, keep it up. God bless you this Advent season." 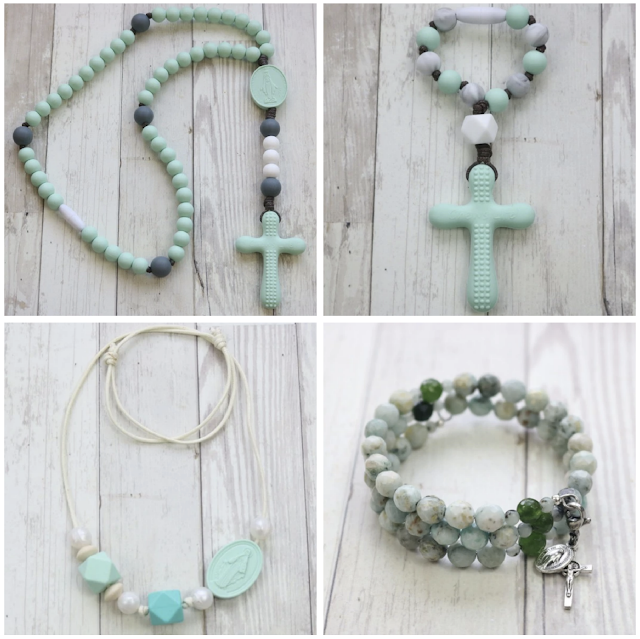 "Always excited about AlmondRod Toys and seeing what new saints she's creating!" "Prize #2 is definitely my favorite. Runners up are 16, 2, 19, 17, and 9. Thank you for all of the work you put in to put this list together! There are many great ideas here!" "Thank you for putting this together in the midst of your move. I know how hard moving can be, physically and emotionally. I love looking at these every year." "I would be so thrilled to win any of the prizes, but especially the missal cover, my dear hubby would love it!" 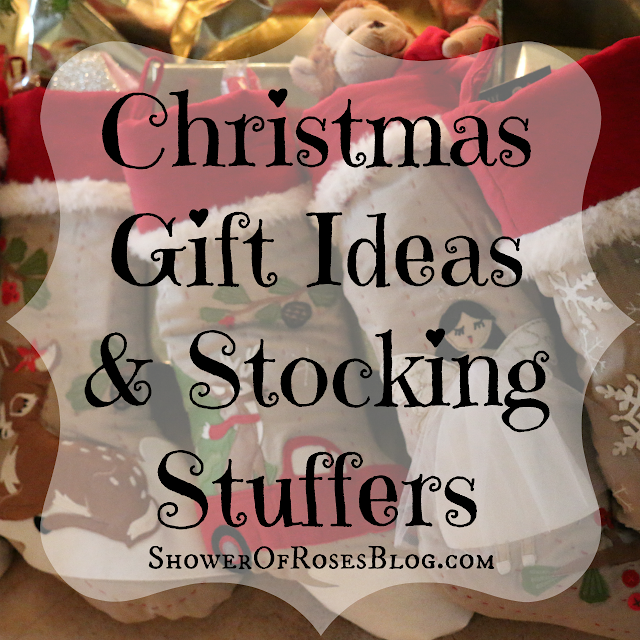 "I love all of the gift picks by the kids. 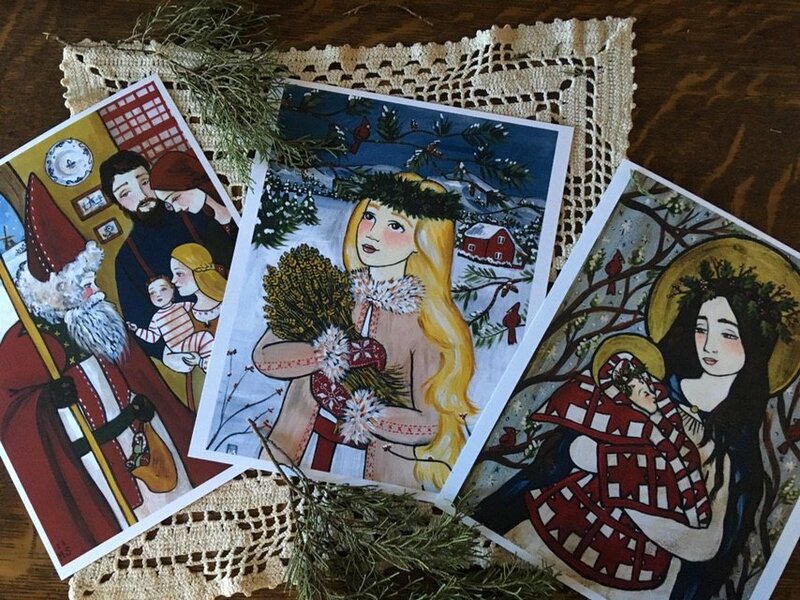 I must say that prize # 19 and prize #21 are my top picks of prizes mostly because I don’t have any religious earrings and they are beautiful and also because I love folk art with a passion and love drawing my own." "How generous! May God bless you!" "Love reading you different blog posts, and we will miss you in Oregon! I'm loving the earrings :)"
"Would love the chance to win the almond rod saint blocks!" "I love your list of ideas!!! Thank you so much for putting this together"
"Amazing giveaways! Always a fun time, and a blessing to see what you have going on each year." "Thank you for the lists! Many of my kids' genders and ages match with yours." 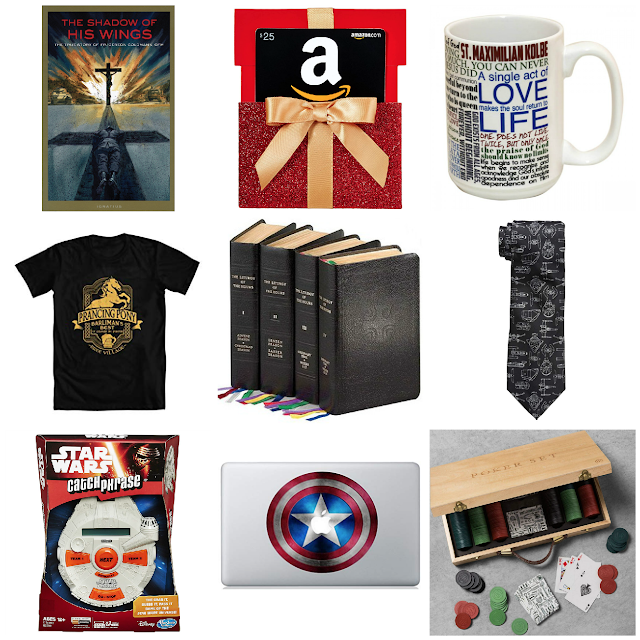 Here's our 2015, 2016, and 2017 Christmas Gift Ideas!